YouWorldTree™ is the website where families and friends meet and connect. 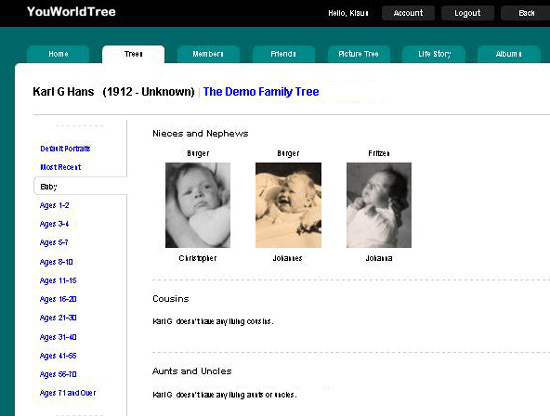 All of the content in YouWorldTree.com is created by users and shared with family members in a private interactive web environment. All users communicate through Living Picture Trees™, an interactive web-based relational picture management application. The Family Picture Tree™ is centered on the family, and members are represented by pictures selected from a collection of yearly portraits. Families are displayed vertically by generations and horizontally within generations. Four generations (equal to a living person's social memory) are presented, starting from the bottom with children and their parents and followed by grandparents and great grandparents. Siblings are only displayed at the children level making the depiction of descended generations very compact and intuitive. 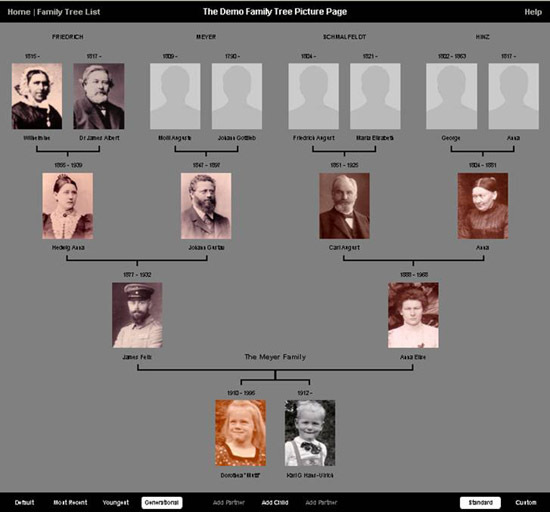 The Family Picture Tree™ is assembled in order of geneology and social partnerships and a person's or a family's name can be freely chosen. Only first names are used for labeling the pictures making the portraits very personal. Generations are displayed (see below) as family members having an appropriate age differences of 20-30 years. 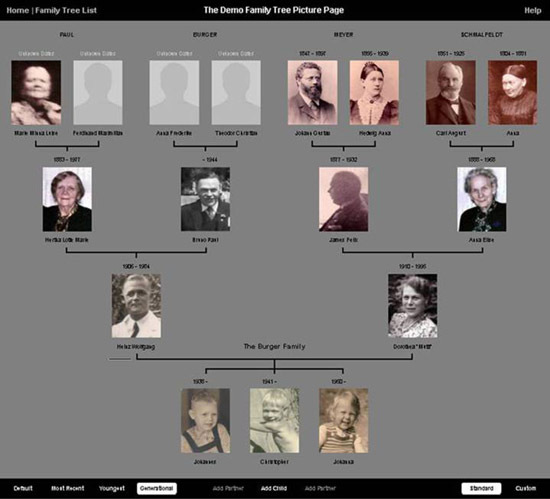 The Family Picture Tree™ is explored by clicking on any person's pictures, their names and dates, or by clicking on the centrally located Family Name. Additional people within the tree are displayed by selecting a picture, at which point the tree is re-assembled. Clicking on parents or their antecedents displays these persons as a child together with all siblings and three generations of descendants. 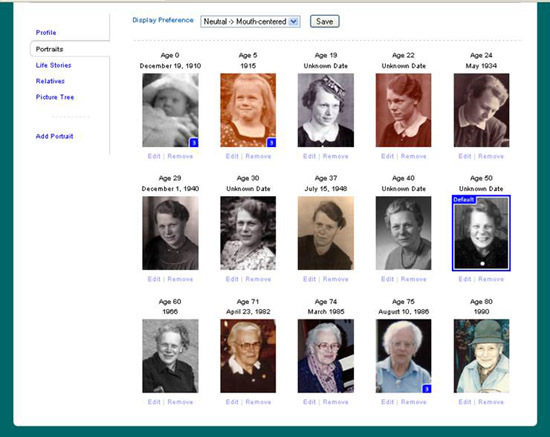 For example, clicking on the mother (see above, third row to the right) displays her with her sibling as child and reveals at the top in a new row the great grandparents (see below). Clicking on any of the children displays them at the parent level including their children if available. It is easy to walk through the generation just by clicking on portraits and appreciating ascendants and descendants and their siblings. The profile for each person provides the tools for uploading pictures and cropping them to the right size and orientation. 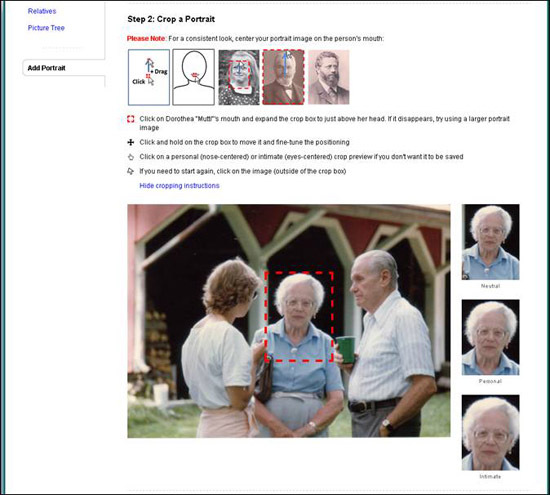 Portraits are automatically generated and added to the collection by simply pointing to the mouth of a person, clicking and dragging the generated crop frame to just above the head. Three different portraits are generated at different close-up magnifications in such a way, that the mouth, the nose or the eyes are in the center of the portraits. These display modes have special social presence attributes equal to the sensation of neutral, personal or intimate and provide a novel way to express personal feelings. The Portrait Collection for each person is sorted by age and allows adding of one portrait per year of life. 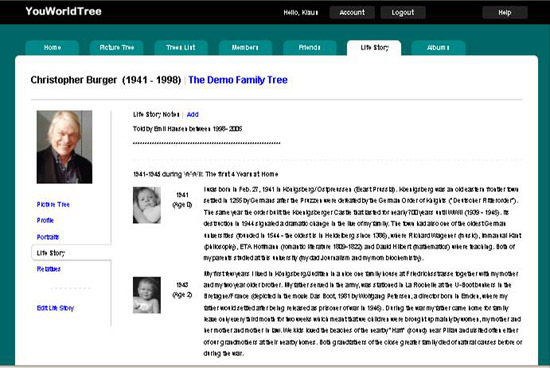 In addition, one of the three social display modes can be selected and will then be applied whenever that person is shown in the user's family tree. In family trees of other users their own selection will be utilized. All persons can be displayed in different social presence modes (Custom) as demonstrated below where the grandparents are presented in neutral presence mode, the parents in personal mode, and their children in intimate mode. Compare this page to the same page displayed above in Standard mode. Relatives are displayed as related to children and include nieces and nephews, first cousins, and aunts and uncles. Clicking on the name of a child will display the horizontal relatives at a selectable age range and social display mode. In the examples shown below, the neutral display mode is chosen for baby age, 5-7 years of age and 8-10 years of age. Available portraits build the backbone for telling the life story of a person. The pictures by themselves often depict events that happened at the time they were taken. Using simple editing tools text can be added to assemble the story. The life story of a person can be accessed by clicking on the dates fields in the Picture Tree or from a person's Profile. Photo Albums can be generated from uploaded and cropped pictures and collected at the family level, accessible from the home page or the centrally located Family Name in the Picture Tree. The home page sequentially displays all activities recently performed by members of a Family Tree. It provides a meeting point for the entire greater family to exchange updates on Data, Portraits, Albums and Life Stories. How can I start connecting with relatives and friends? The creation of an account is free of charge. 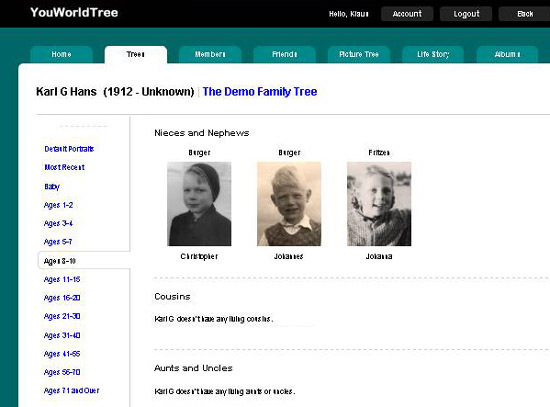 Each user starts their own family tree and can invite other relatives to be members of the tree. At the sole discretion of the owner, invited members can be provided with different access rights to contribute or invite others to join the community. Thus, in a short time dozens of members can be participating in a tree and share their heritage and their families. Friends can be invited to join but will have only limited viewing access. How is my information shared and my privacy protected? Any user of this website must be at least 13 years old to open an account and entering the private section of the site requires a valid e-mail address and password. The registered user must either create a new Family Picture Tree™ or accept an invitation to an existing family tree. None of the information submitted to this site is publically available or searchable. No other account holder of the YouWorldTree community has access to any data submitted by an owner of a tree except in the case that the owner specifically invites other account holders as members or friends. This means that the owner of a Picture Tree has exclusive control over privacy. All of the submitted information, including names, dates and e-mail addresses, will be kept private and will not be made available to third parties (see Site Policy for details). In addition, all information transferred to and from this web site is secured with an SSL Certificate encryption (Secure Encrypted Communication: https). What are users saying about the site? 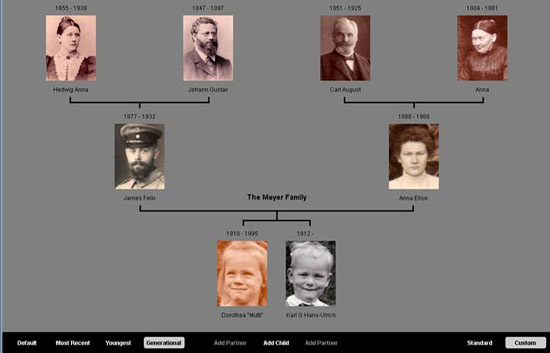 "This family tree web site has been a real joy to learn and to use. In a few hours I was contributing to our family tree. I was able to add over 300 names of our direct ancestors back to 1641. Of course I did not have photos for those, but I have begun to add photos of grandparents down through the great-grand nieces and nephews. It has been most rewarding to record photos at the various stages of one's life. Also, I have found that it is easier to write one's "life story" when it is written to accompany a photo every few years. One can more easily reflect back on what was happening at that specific time period. After a few tries, I learned that a group photo did not have to be cropped in one's photo gallery prior to importing for this web site. This has made recording the photos very simple and Oh, So Much Fun!! Please know that I am a true novice to internet use. I am 72 years old and had only gone onto the internet about a dozen and a half times before attempting to use this valuable web site. 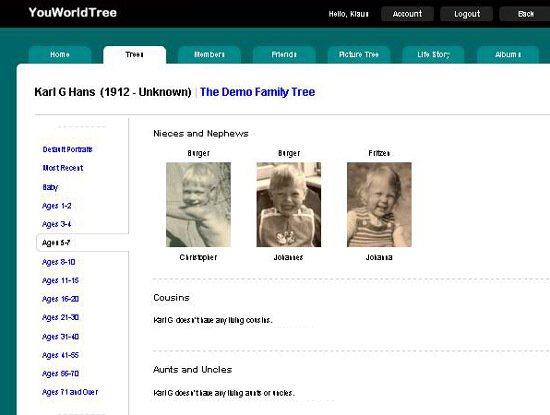 YouWorldTree's family connections are fun to use!